I’ve barely touched my blog since moving home from Israel to New York – it’s so easy to get swept up in life here! But Rosh Hashanah, which is early this year, is fast approaching and so I’m snapping out of my summer blog hiatus to bring you this incredible honey cake recipe from Cook in Israel: Home Cooking with Orly Ziv (the cookbook that I photographed). Honey is traditionally eaten on Rosh Hashanah to signify a sweet new year, and honey cake can commonly be found on Jewish tables around the world this time of year. I’m not always a huge fan of honey cake, which can be quite dense, but Orly’s version is light and spongy with lots of wonderful honey flavor that’s not overly sweet. Enjoy this traditional honey cake to celebrate a sweet new year for Rosh Hashanah. 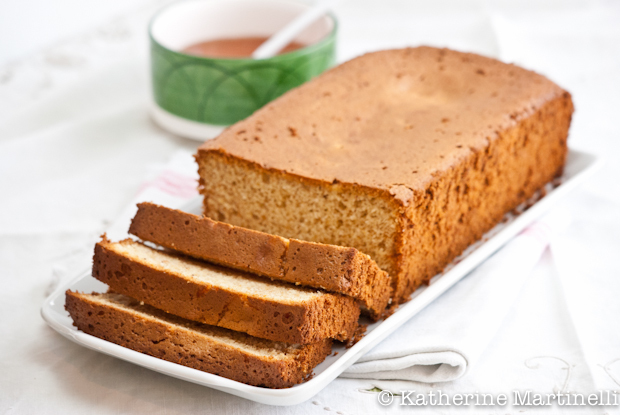 Even if you don't normally love honey cake I can guarantee that this recipe is a must try! Preheat the oven to 170°/340°F. In a large bowl, beat together the egg whites and sugar with an electric mixer at high speed until soft peaks form. In a separate bowl, whisk together the egg yolks, oil, honey, cinnamon, cloves, and salt. Add the flour to the honey mixture and mix slowly with the mixer on low speed until blended. Gently fold the flour mixture into the egg whites. Pour batter into a large cake pan or 2 loaf pans and bake for 55 to 60 minutes, until golden brown on top and a toothpick inserted in the middle comes out clean. Allow to cool slightly before serving. So glad you are back on line !! I missed you and your posts. I love the simplicity to this cake. It sounds truly lovely. Your honey cake is beautiful. What a great cake for celebrations. Thanks for sharing and have a beautiful weekend. I made this cake today for anyone wondering, and it was superb. It is very mild, and is reminiscent of a coffee cake taste-wise. Perfect in the morning with some coffee or tea. But the mildness is all the appeal… very pleasant to eat. Also– getting the egg white/sugar mixture to the right consistency to where you have soft peaks is quite laborious, but worth it!